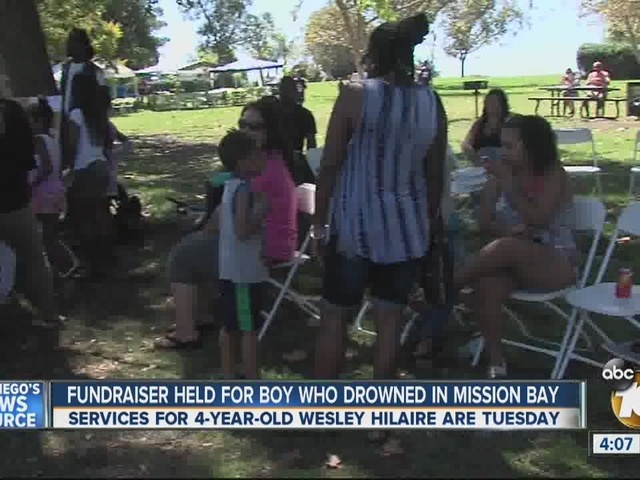 Relatives and friends held a fundraiser BBQ Saturday at Berry Street Park in San Diego for the Hilaire family, who tragically lost 4-year-old Wesley Hilaire when he drowned in Mission Bay last week. Relative Calvin Hicks said the money will help the family with the numerous unexpected expenses. Wesley Hilaire was reported missing last Saturday night as the family was packing to leave Mission Bay after spending the day there. An Amber Alert was issued and an intense police search ensued. His body was found floating in the bay Sunday morning, about 100 yards off shore. The fundraiser started at noon and goes until 5 p.m.
Wesley will be cremated Tuesday following his funeral service. A local funeral director is taking care of all costs associated with his service.